I wouldn’t call myself a huge fan of cartilage and was never really all that into say the lechon’s ears and tail, that some others just absolutely consider to be the must have parts of the roast. 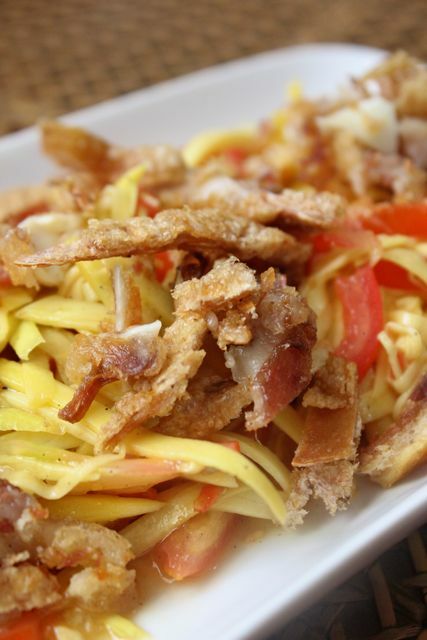 But with a bunch of lechon ears in the test kitchen, I decided to deep fry a few of them, chop them up and top a familiar salad of shredded green mango (here a bit yellow but still sour) and sliced tomatoes with a patis (fish sauce), bagoong (shrimp paste) and vinegar dressing. I have to say, it tasted pretty good. The crispy/chewy ears against the sour and salty salad were a very appealing match to me and many of the crew who sampled the dish. Considering that some sisig versions have liver or even brains, this sounds tamed down. One of my fondest taste memories is the kapampangan version of binagoongan made with pig ears that my mother learned to make from her mother. i’m drooling at the thought of eating this, MM! No doubt, this dish will be a hit. bam!!! i love this already. whenever i find myself in front of a roadside barbecue cart, i am drawn to these pork ears! they jump out to me like yummy treats amongst a mixed heap of charred animal entrails. i’m not even talking figuratively here. the bbq pork ears are cut randomly, having unequal parts of skin, cartilage and fat. while every portion will have the skin, most have little/no cartlage and lots of fat, while a few have mostly cartilage and little/no fat. the latter is obviously the reason why the good lord put ears on pigs. these are heavenly. crispy and chewy –as mm aptly describes above. once in a while, you will encounter a bbq cart operator who obviously understands the pork ear afficionado. he will use just the ear lobes and discard the ear ..ummm.. base. this godsend then prepares the pork ears –with mostly cartilage and little/no fat– into half inch squares and lines them up nicely on a stick. beautiful. so instead of me taking home all pork barbecues, i normally have a sinful quantity of pork ears which guarantee me a looong dinner with my wife warning me about my cholesterol levels. all for the love of pork ears. Love!!! I feel very enthusiastic about ‘gnawing on ears’ as you put it. From the first time I tasted ‘tenga’ barbecued straight of the grill from a street vendor I was hooked! I would so love this MM! Wow, this is the best part to eat. Even when braised with dark soya sauce together with eggs, beancurd, intestines and skin, is really true Asian dish. They have been selling chicharon pork ears (sliced in slivers) here in Southern California for years now. At one time, it became a huge hit. They are still available in our Asian stores around town. And yes, they are yummy! Would be a great appetizer :-) Needs a touch of green, though, like some cut chives, spring onions or perhaps a sprig of parsley on top. Hey MM! Glad you’re back. I love pork ears. If Crispy Tenga was on a restaurant menu, I’d be sure to order it, to accompany a cold beer. Your version above takes it several notches higher! Tokwa’t Baboy also becomes more interesting if there were some slices of pork ear added to the usual meat/fat. It provides variation in texture. @jules winnfield, i’m one with you regarding street-side grilled pork ears. I love pork ear barbecue and our local name for it; dalunggan. The long gun. The long gone. Looks good….You just have to very quiet when you eat them . Love it in Tokwa’t Baboy! “crispy tenga” is popular barchow hereabouts, so you’ve once again ramped up a classic! I will surely try this delicacy . I’m in trouble and finding ways to convince my hubby to spend few days in Cebu instead straight Bohol…your res’t is in my bucket list if not no.1 . sigghh I’m hungry he he he …. 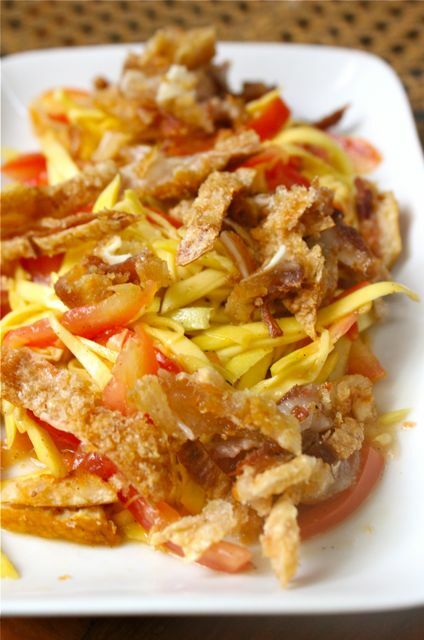 Spotted Pig here in NYC has a Crispy Pig’s Ear Salad that I really love. It’s whole crispy pig’s ears on top of greens and a lemon-caper dressing. Quite good. Man! This just made me salivate at 2:19 in the morning! Where are crispy pig ears when you need them?